Catch as many balloons as you can—but be careful not to fall off your skateboard. 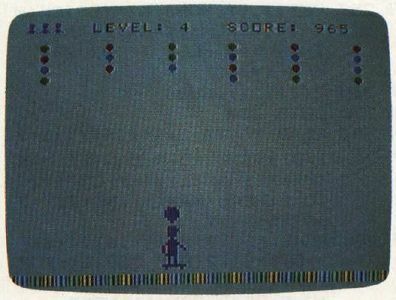 This whimsical game was originally written for Atari computers with at least 16K RAM. We've added versions for the Apple II series, Commodore 64, IBM PC (with color/graphics adapter and BASICA), IBM PCjr (with Cartridge BASIC), and TI-99/4A (with Extended BASIC). The 64, IBM, and Atari versions require a joystick. A joystick is optional with the TI version. 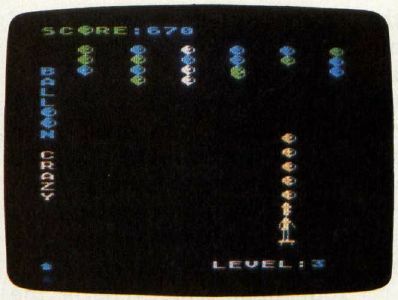 The Atari and Apple versions can also be played with paddles. "Balloon Crazy" is a game that children can enjoy, yet its higher levels are a challenge for adults. The goal is simple: You must zip back and forth across the screen on a skateboard while catching falling balloons on top of your head. Since some of the balloons fall very fast, that's not as easy as it sounds. After you've caught enough balloons (six in most versions), you can reach up to pop them, then catch some more. If you miss just one, you lose all the balloons currently in your possession. Type in Balloon Crazy from the listing for your computer, then save a copy of the program before you try to run it. Every version of the game is similar, so be sure to read the general game rules before referring to the specific notes for your computer. 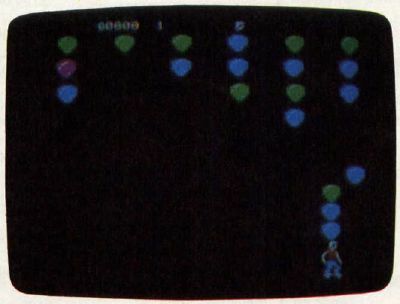 Each game begins by displaying several rows of multicolored balloons at the top of the screen. You are the skateboarder at the bottom. When a balloon begins to fall, move directly under it and catch it on your head. The blue balloons fall slowly, which makes them easy to catch ( but worth the fewest points). The green balloons fall faster, but swiftest of all are the red balloons. As soon as you snare a balloon, it joins the pile on top of your head. Should you miss a balloon, you immediately fall off the skateboard. All the balloons on your head fall and pop. Points are scored only when you have caught the required number of balloons. You have three players to work with in each game: Falling off the skateboard costs you one player. Clearing all the balloons from a screen permits you to advance to the next level—where everything becomes more difficult. Bonuses are awarded at appropriate intervals, and you can earn an extra player by scoring 1,000 points. Though the balloons become harder to catch at higher levels, you are never helpless to prevent them from hitting the ground. Should a balloon miss the top of the pile, you can bounce it back into the air by holding down the fire button (or the space bar in some versions) and running into it. The balloon will then float back into the air, and you may try to catch it again. Balloon Crazy (Program 1) runs on any Atari computer with at least 16K RAM (or 24K for disk). Plug a joystick into port 1 before you run the game, and press START to begin. At the first level, you score 5 points for each green balloon, 10 for blue, and 15 for red. These values are multiplied at higher levels. A bonus player is awarded when you reach 1,000 points and at intervals thereafter. Move left and right with the joystick, and press the fire button when you want to hit a balloon. You must hit the balloon with the player's arm. Since the player has a limited reach, be careful not to knock a balloon completely away. (replace name with the filename used when you saved the program). Then type SYS 49152 and press RETURN. You must collect six balloons on your head in order to score points. Blue, green, and red balloons are worth 10, 20, and 30 points, respectively. Use the joystick to move left and right, and press the fire button when you have missed a balloon and wish to bounce it upward. You must hit the balloon with the upper part of the player's body. Note that the player can wrap around from one side of the screen to the other, but the balloons cannot. As a bonus, you are awarded an extra player after completing level 5.
where name is the filename you used when you saved Balloon Crazy. You can play the game with a paddle on any Apple II computer: Move the paddle to control the player, and press the paddle button to bounce the balloon upward. Alternatively, keyboard controls can be used on the Apple IIc and Apple IIe: press the open-Apple key to move left, the closed-Apple key to move right, and the space bar to bounce. Four balloons must be collected to score points. If you miss a balloon completely, all the balloons on your head drift off into space and disappear. There are nine game levels. Red balloons do not appear until the second level, but each higher level contains more red balloons. You may pause the game by pressing RETURN; resume play by pressing the space bar. IBM PC/PCjr Balloon Crazy (Program 4) requires a joystick and BASICA (if you have a PC) or Cartridge BASIC (PCjr). You may want to unlock the horizontal axis of the joystick. Before the game begins, you have an opportunity to adjust the joystick if needed: Press Y when prompted and follow the instructions on the screen. In this version, all balloons are red and are worth the same number of points. The number of balloons you need to catch depends on how many rows of balloons are left on the screen: Only three are required at first, but this number increases each time you clear an entire row of balloons. When clearing the top row of balloons, you must catch seven balloons to score. There is no way to bounce a missed balloon back into play. After clearing an entire screen of balloons, you may advance to the next screen. Your final score reflects the number of balloons caught (no bonus is awarded). You may adjust the difficulty of the game by changing the statement DF = 10 in line 120. The variable DF controls how close you must be to a balloon to catch it. Changing DF to a higher value makes the game easier, and decreasing it makes the game more difficult. Balloon Crazy for the TI (Program 5) requires Extended BASIC and is played with either keyboard controls or a joystick. Press the S key to move left and the D key to move right. You cannot bounce a balloon back up after missing it. When you catch a balloon, it turns the same color as the player and immediately increases your score. At higher levels, the balloons fall faster and are worth more points. The game ends when you have lost all three players. 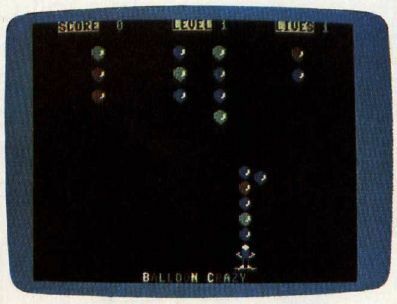 Player/missile graphics animate the player and balloons in the Atari version of "Balloon Crazy." 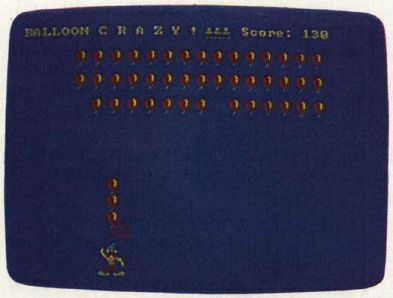 "Balloon Crazy" for the Commodore 64 uses sprites as well as character graphics. The player is just about to lose a collection of balloons in this game of Apple "Balloon Crazy." 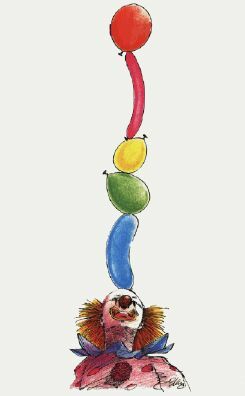 The main character in IBM PC/PCjr "Balloon Crazy" is a humorous clown. "Balloon Crazy" for the T1-99/4A can be played with the keyboard or a joystick.